Dhaka, April 15 : Bhutanese Prime Minister Dr Lotay Tshering wrapped up his four-day state visit to Bangladesh on Monday that expected to further “strengthen the bonds of friendship” between the two countries. 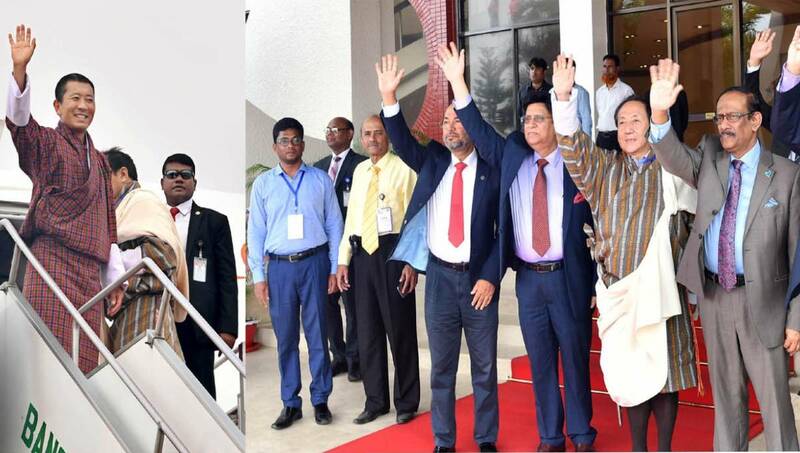 Foreign Minister Dr AK Abdul Momen and State Minister for Ministry of Disaster Management and Relief Dr Md Enamur Rahman saw the Bhutanese Prime Minister off at Hazrat Shahjalal International Airport in the morning, said an official. Foreign Secretary M Shahidul Haque, among others, was present. The visit witnessed signing of a number of bilateral documents including SOP for the operationalization of the MoU on Use of Inland Waterways for Transportation of Bilateral Trade and Transit Cargoes between Bangladesh and the Royal Government of Bhutan. Dr Tshering paid the visit from April 12-15 April, coinciding with the festive period of the Bangla New Year Pahela Baishakh, at the invitation of Prime Minister Sheikh Hasina. The Prime Minister of Bhutan was accompanied by his spouse Dr Ugyen Dema, the Foreign Minister, the Health Minister, other senior government officials of Bhutan, and a business delegation.